This online slot is not magic in the conventional sense but will have you unpicking its brickwork as you navigate free spins with your friends in this 5 reel slot. Set against a brickwork background and using a cartoony style join the family and their trusty dog to match 6 symbols to win huge amounts of quirky prizes. Leander Games are a thriving independent online slot game company. They are particularly skilled in designing innovative video slots, and pride themselves in their outstanding game portfolio, with options for both social and real money gaming. In fact, the company were presented with the award of “Social Gaming Supplier of the Year” at the eGR B2B Awards in 2013, and have recently been nominated for numerous other prestigious awards – a real testament to the quality and breadth of their portfolio. With such titles as Zombie Rush and Little Pigs, Leander clearly thrive on making innovative and fun to play games. You would be forgiven if you think that Magic Building would be about lots of wizards in a tower, casting spells at each other. Leander Games, however, took this online slot game in an art direction I do not think would be expected! 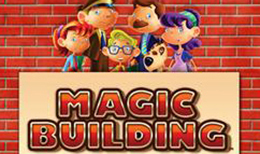 Following a family, a dog, and a lift attendant, this Magic Building is a simplistic slot game with a fairly neutral art style; making it perfect for a relaxed play method. With the background of the game being a brick wall, the reel is clearly meant to function as the ‘magic building,’ with characters opening their windows and waving to you as you spin the wheel. With a mix of these characters and classic casino slot symbols, this slot is aware of its roots in the gaming world, while at the same time presenting the player with a relaxed atmosphere to enjoy spinning. The music is a little annoying, as it loops often, but it is not at all difficult to turn it off; in fact, you can still keep the win sound on if you like that! This five by three reel system is perfect for beginners and experts alike. Every time you win across its twenty five pay line structure, it clearly shows which line you won on, and how much – even in auto play! Although this makes the spins last a bit longer, Magic Building works well as a simple, no-nonsense approach to online slot gaming. While taking its time, the player can appreciate how they get the winnings they get, ultimately meaning that they stay for longer! Coupled with a clear art style, it is easy to stay with this game for many hours at a time. Because of this, the simplicity of this game matches the betting structure – with a minimum of 0.01 per pay line, and a maximum of 0.50 – this game is clearly suited to low rollers. Luckily, the special symbols match the simplicity of this game. Although this does mean you do not end up with huge amounts of free spins and multipliers, Magic Building has a bonus round you should not turn your nose at. If you get three, four, or five bonus Elevator symbols, you are given ten, fifteen or thirty free spins respectively. The symbol inside the ‘tall’ elevator during this time counts as that symbol across the whole reel, meaning it is unlikely that you won’t win prizes! A simple game, with a relaxed aesthetic, Magic Building will be the game you come back to while you don’t want to have lots on your plate. Definitely recommended!